Dre Grigoropol of ComicsBeat.com has a great review of Xeno Kaiju. read an excerpt of his review below. This very fun and playful comic takes the reader back to a childlike wonder state of mind. 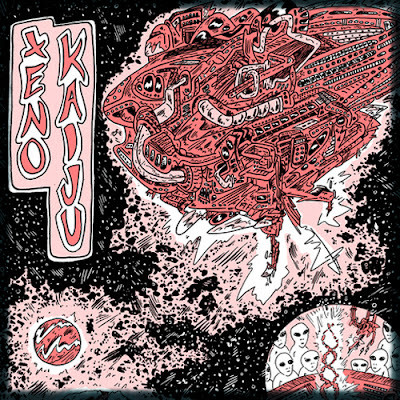 The name Xeno Kaiju means “strange outlandish creature”, which fits well with the overall style. You won’t find any words spread upon the pages, opting to allow the drawings create a dialogue of their own. Aulisio’s lack of text, not only dares the reader to delve into his imagination, but gives the comic accessibility to all ages, as well as, speakers of various languages. Aulisio finds success in this bold style of story telling, through his unique illustrations that focus heavily on line work, and sharp creativity. The comic features a tortured futuristic urban landscape, depicted through fiery squiggles, scribbles, crosshatches, patterns, and textures. The city that Aulisio has brought to life has a Futurama feel, complete with cluttering skyscrapers, skyway, and futuristic transportation tubes. A little baby lizard is sent to Earth in a capsule by aliens who exists in an orbiting city in the sky outside of Earth. On Earth, the lizard incubates in its egg, hatches, and ascends to adulthood, eventually reaching Godzilla-like proportions. The giant monster instinctively begins to terrorize and attack the city, guiding the reader through a story similar to Godzilla, but with the unique perspective of the aliens themselves. The comic has an eye in the sky viewpoint both in the story and in the imagery itself.